The Geordie ace is feeling unstoppable after producing another stunning display of brutal power to destroy Paul Hyland Jr in one round to take home the British Lightweight title for keeps in June. The ‘Sandman’ put the unbeaten Belfast man away in a similar fashion to the devastating defences against Manchester’s Joe Murray (first round) and Lytham St Anne’s Scotty Cardle (second round). 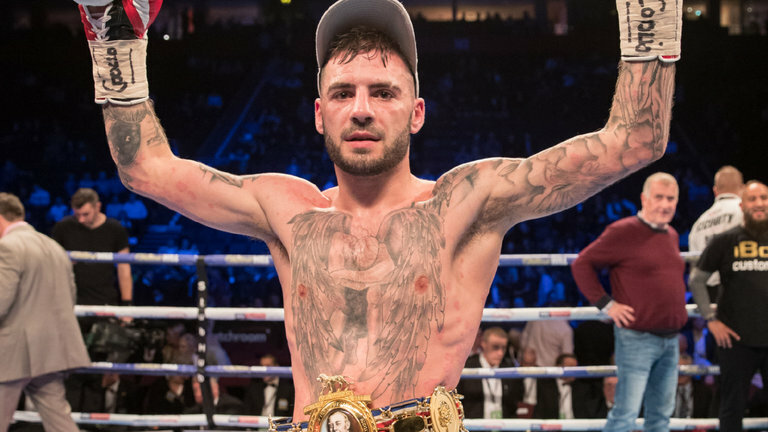 Ritson’s fanatical support blew the roof off the Tyneside arena in June and the Forest Hall fighter is promising another unforgettable performance in October as he sets his sights on European honours and beyond. “The atmosphere inside the Metro Radio Arena was unreal in June and I can’t wait to get back in there on October 13,” said Ritson. “It’s been a rapid rise and I can’t wait to headline on the big stage again live on Sky Sports. “The most important thing for me right now is keeping busy and I’m delighted to be fighting in an eight rounder on the Khan vs. Vargas undercard in September as well. I’m focused on winning and improving with every fight. Rising Light-Heavyweight star Joshua Buatsi features as he takes part in his eighth professional fight after landing his first title at The O2. He picked up the WBA International title with a stunning first round win over Andrejs Pokumeiko and will be looking to push on again on October 13. Liverpool’s Robbie Davies Jnr faces Sunderland’s Glenn Foot for the British and Commonwealth Super-Lightweight titles. Foot puts his Commonwealth title on the line for the first time after securing it with an 11th round stoppage win over Scotland’s Jason Easton in Glasgow in March. Davies Jnr dropped Michal Syrowatka three times on his way to avenging his sole career loss and winning back his WBA Continental strap last time out. David Allen also returns after his ‘life-changing’ win over Nick Webb on the Whyte vs. Parker undercard at The O2 last month. The Doncaster fan favourite produced the moment of his career, sensationally stopping Webb with a devastating right hand in their British Heavyweight title eliminator. Full details of the October 13 card will be announced at a press conference in Newcastle later this month.